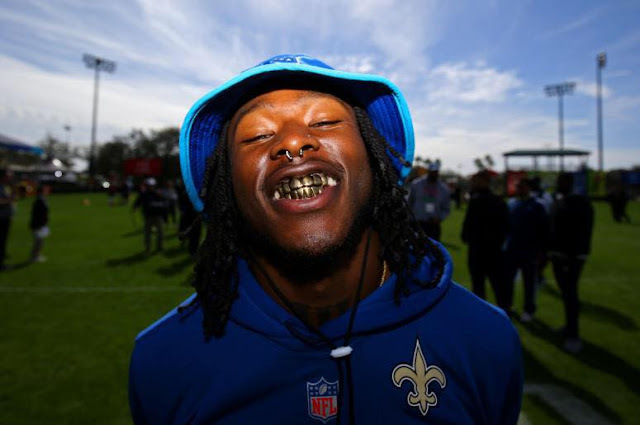 Bleacher Report – "Chasing Alvin Kamara: The NFL's Reluctant Star"
"Kamara briefly stepped out of the section to dap up Falcons running back Devonta Freeman at his section, the only person he cared to genuinely acknowledge. Everyone else received half-hearted handshakes and head nods when they tried to spark up a conversation. He took a shot with Freeman before returning, one of two drinks Kamara had all night." "The club lights turn on just after 3 a.m. Kamara flashes the flight itinerary on his phone that he procrastinated to book until after dinner. He has to jetset to Miami at 5:50 a.m, where he trains during the offseason to make it to his 11 a.m. workout at Florida International University. He's confident he'll make his workout as he leaves for the airport."